While black celebrities such as Oprah continue to claim that Obama is opposed and disrespected because he is black, the truth is the polar opposite. http://bit.ly/17cgZUi Because Obama is black, he enjoys unprecedented imperialistic power and respect. Obama ignores the Constitution, and changes and refuses to enforce laws at will. Despite impeachable offenses, white America does not have the stomach to impeach the first "African-American" president. Consequently, Obama's lies and deceptions continue to devastate the lives of millions of Americans without serious push back. A courageous black woman, Rosa Parks, played a major role in launching the civil rights movement by refusing to take a seat in back of the bus. Ironically, our first black president has forced the Constitution, the law, freedom, and liberty to the back of the bus. How are millions of white Americans responding to being called racist by black celebs (Oprah, Samuel L. Jackson, Morgan Freeman, and others) who have become multimillionaires as a result of white patronage? http://bit.ly/1bKg4Ml These black celebs are absurdly using a refusal to rubber stamp Obama's liberal socialist/progressive agenda as evidence of racism against a black president. And yet, a majority of white Americans give their black accusers a pass – probably for the same reason they voted for and have given Obama a pass. White guilt. Not only is racism from blacks tolerated, liberals appear to believe at least a minimal amount of resentment against whites is required for a black not to be an "Uncle Tom." As a black conservative, I have been much criticized by white liberals for my lack of anger and resentment against white America. Oprah playing the race card is surprising and disappointing. Oprah's rise to American goddess status was built upon her ability to transcend race. The vast majority of her loyal fans are white. Why would Oprah boldly without hesitation dis white America? At first, I thought Oprah and other black celebs' brain-dead approval of Obama was all about skin-color. I was wrong. Black celebs who are typically liberal vilify black conservative Republicans. 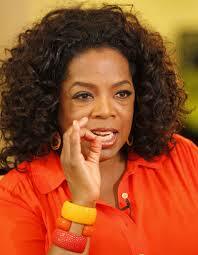 While racial loyalty does come into play, first and foremost Oprah is a liberal. Obama champions Oprah and her Hollywood buddies' liberal agenda. Like a religious fanatic willing to sacrifice everything for their faith, zealot Oprah is willing to sacrifice the good faith she has built with mega millions of whites over the years to further her religion of Liberalism. Barack Obama, the president protected by his black iron-man suit, is the perfect vehicle to implement Oprah's dream agenda. In 2008, millions of excited, well-intentioned white Americans rushed to vote for the first African-American presidential nominee. They naively assumed a black president would be the ultimate apology for slavery and America could never be called a racist nation again. They were wrong. The Obama Administration has polarized America dramatically; exploiting race whenever it serves its purpose. Millions of white Americans have been voting for Oprah with their TV remotes for decades. If America is racist, how is it possible that a thumbs up from a black woman could equal a New York Times best seller and millions of dollars generated for an author? Oprah and Obama were granted a golden opportunity to strongly influence the healing of America's racial divide. Oprah and Obama betrayed white America. Both chose to embrace the dark side, sacrificing national race relations on the alter as a burnt offering in worship of Liberalism and the furtherance of its agenda. In the mind of Oprah and her fellow liberals, furthering the liberal agenda trumps common sense and the best interest of the American people. If we would simply surrender total management of our lives over to liberals, they will transform America into a utopia. Achieving liberal Nirvana trumps everything. Thus, the reason why Oprah and Obama have thrown their loyal white American fans and voters under the bus. Rather than these two gifted Americans using their charisma, power, and influence to bridge the gap, they continue to further the great racial divide.